2013 started out with the launch of our digital museum on Financial History. It is called Financieel Erfgoed op de Kaart and is a website that contains the stories and lokation where financial history happened. The site can be viewed on the desktop, in which case it looks like a rich google-map, or via the mobile. The mobile is sensitive to the location and will show the nearest hot spots of history as well as a responsive mobile menu. The launch was covered in both national and regional media and has a steady flow of visitors ever since. We organised several taylor-made walking tours on the financial history of Amsterdam for visiting US Students, Norwegian insurers, financial supervisors, Nyenrode college students, employees of Booking.com and the Dutch Ministry of Economic Affairs. On top of that we introduced a boattour on the financial history of Amsterdam, for two large organisation in the financial sector. In april of 2013, the Filosofy night was dedictaed to the theme of guilt and debt. We presented an overview of history and future of money with the title: “Back to the future”. In addition we joined a radio show conversation with Werner Trio of Radio Klara on the topic of money and value. The Filosofy Night occured in the former Exchange building: 'de Beurs van Berlage'. This inspired us to dedicate a separate part of our virtual museum on the financial history to this site. Since then, all visitors of the Exchange building can use their mobile phone to have a look at the financial history of that building. We wrote some guest blogs. One was about Leviathan for Felix Meritis, the other was a blog on the hands, swearing an oath, at the Amsterdam Museum site. Apart from that we regularly published in the online-blog of the Dutch Financial Newspaper: het Financieele Dagblad. We presented an unknown story of Amsterdam's city giro for a festive event in June and held a workshop on the future (and past) of money for a large financial institution. To end the year, we were asked to join the Dutch radio show Casa Luna to talk about the history of money, alternative payments and the current situation in the banking sector. This was a very inspiring two hours of discussion, with a nice deviation to the role of artists and their capability to point out the faults in the financial system, way before supervisors acted. In 2014 we will continue sharing our passion for financial history with all visitors to Amsterdam. 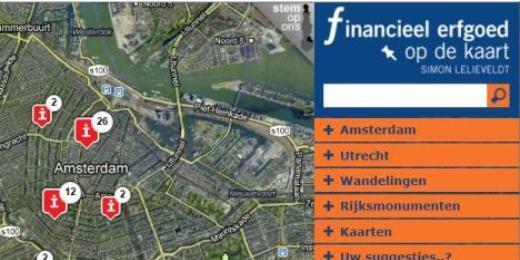 We will develop a pub quiz on financial history and launch an iTours app on the financial history of Amsterdam. It will show pictures from the city archive and allow you to experience the history in your own pace. We look forward to seeing you in the new year ! Yesterday evening, the Dutch RTL-news released a number of confidential documents about the supervisory and regulatory discussions on SNS Reaal Group. And while it could be expected that bits and pieces of this process would slowly enter the public domain, I must say this is a very rapid disclosure. It also allows a further reflection on the very recent financial history: the nationalisation of SNS Reaal Group. - thus: the CVC offer stands a good chance of continuing. Meanwhile the regulators' view is also quite clear. DNB, the central bank and supervisor, has been very patient and lenient in allowing the search for possible private-public solutions. But at some point they have to draw the line. This point arrives when the SNS-CEO and CFO explain in January to the Minister that it is either the CVC bid or nationalisation. Perhaps they hoped that this would force a momentum for the CVC-rescue. Instead, this statement may have finally convinced the Ministry of Finance and DNB that a nationalisation was indeed the only option. The proposed deal of CVC did indeed, as our Minister of Finance explained during a press conference, contain too many goodies for CVC with too little compensation for the State. Furthermore, as I was expecting, CVC was asking for something impossible: the committment of the supervisor not to intervene in the coming years. In sum, the private-public rescue action was nowhere near to a solution that suited both the business and the regulatory constraints. The RTL-papers also clarify the run-up to the nationalisation. It's interesting to note that at the end of 2010, the supervisor observes that SNS Reaal Group is undercapitalized and unable to really wheather a further storm in the market or the media. From that moment on, all work is geared towards eliminating the risks in the portfolio and getting SNS Reaal to take all necessary action, including the sale of parts of the company. I think 2011 also marks the start of a period in which both DNB as a supervisor and the Ministry of Finance become aware of the fact that some form of rescue may be necessary. But it's a different rescue this time. There are obstacles that stand in the way of the usual solution: inviting the biggest Dutch players and working out a way to safeguard continuity. This did still work for the smaller Friesland Bank (absorbed by Rabobank), but is impossible for the more complex SNS Reaal Group. As FT Alphaville puts it, the SNS demise was an accident waiting to happen. While bank board and supervisor were doing their utmost to save the bank, the losses and problems were just too much. In this respect it should be noted that in these years, the politicians did a good job at confusing and complicating the financial markets with their prolongued sovereign crisis. In combination with all the post-financial crisis measures, this meant that there were no buyers or parties in the market that would be interested in helping solve the SNS problem. At the same time, SNS could benefit from the crisis by using ECB-funding to buy time. Essentially we can see that the years 2011 until the beginning of 2013 all eyes were focused on getting to save SNS Reaal. And in that time the so-called Intervention-law (allowing nationalisation) was also being developed and ratified. It think that this law and the principles of trying to seek a private solution within its regulatory framework, focused the minds of all persons involved, whether bankers, supervisors or civil servants. But is it the endgame that matters? We should note that the true accident happened in 2006 when SNS did not limit its risks when taking over Bouwfonds Propery Finance. In doing so they exposed themselves to a continued drain on their profits and capital, which they were unable to neutralize. When the financial crisis further evolved and lead to a further worldwide change in risk and capital attitudes, the situation had essentially become unsustainable. SNS Reaal had become, in the Netherlands, the elephant in the room, that no one dared to discuss. This leaves us with an interesting but highly hypothetical scenario. What would have happened if, at the end of 2010, the supervisor and Ministry of Finance would have stepped back a bit further. Suppose that they would have outlined that any resolution for SNS Reaal Group would have to occur in a stressed market. Which is a market in which it is hard to expect to get a good deal. And thus, they could have argued, while the financial stability of the market was not (yet) at stake, nationalisation of SNS Reaal or ringfencing of some of its activities were essentially the only two options in 2010. My guess is that the public might have resented such an approach as being too premature. Yet, if we truly wish proactive supervision, we must also be willing to allow unexpected and early interventions, rather than just the end-of-the-road nationalisations. And it is in this respect that the current Intervention law doesn't help. It details a roadmap for the last part of the journey of a bank in despair, and thus focuses all energy of the involved players on remaining within that roadmap. As such it blocks and diverges the attention from other solutions that might have been possible and useful on the earlier bits of the road. Vandaag lanceer ik officieel de site: 'Financieel Erfgoed op de Kaart'. Dat is een online 'virtueel' museum, dat de financiële geschiedenis van Nederland ontsluit op basis van de lokatie (Google Maps). De verhalen uit die geschiedenis zijn te vinden door in te zoomen en te klikken op de i, of door het menu rechts onder Amsterdam verder uit te vouwen en een informatiepunt te selecteren. Ik heb Financieel Erfgoed op de Kaart gelanceerd om de verborgen verhalen uit de Nederlandse financiële geschiedenis op één plaats te ontsluiten en bewaren. Overal in het straatbeeld zijn namelijk nog sporen te zien van de financiële geschiedenis. Maar de verhalen erachter zijn niet altijd meer bekend, terwijl ze toch nog steeds boeiend en relevant zijn. Neem bijvoorbeeld de Munt in Amsterdam. Dit gebouw is slechts één jaar in gebruik geweest voor het slaan van munten. Het gebouw brengt ons terug naar 1672 waarin Nederland onder de voet werd gelopen door Frankrijk, Engeland en twee Duitse prinsen. In feite bleek toen dat Nederland, als klein land, voor haar zelfstandige voortbestaan altijd erg afhankelijk is van de omringende landen en er het beste aan doet zich te voegen naar de dynamiek van de grote buurlanden in Europa: een inzicht dat ook nu nog steeds relevant is. Op www.financieelerfgoedopdekaart.nl kan een bezoeker vanachter de PC thuis een 'wandeling' door het financieel erfgoed maken. En wie zélf op pad in Amsterdam is en de site op de smartphone opent, ziet de informatie over de meest nabije historische plaatsen getoond in een menu. Ook kan de augmented-reality toepassing Layar worden gebruikt. Op dat moment fungeert de stad feitelijk als openluchtmuseum. In dit digitale musuem staat het verhaal van de financiele geschiedenis centraal. Per lokatie komt een deel van die geschiedenis aan bod: een persoon, een gebeurtenis, een gebouw of een organisatie. Op elke plek wordt informatie en audiovisueel materiaal gebundeld die normaal gesproken op allerlei afzonderlijke plaatsen te vinden is: de archieven van financiële instellingen, foto's uit de beeldbank, kennis uit wetenschappelijke artikelen, de collecties van musea, gedenkboeken, wikipedia enzovoorts. Het platform richt zich nu nog op Amsterdam en is tot stand gekomen in samenwerking met het stadsarchief Amsterdam, het Amsterdam Museum en het Joods Historisch Museum. Het zal door samenwerking met universteiten, lokale museau en historische kringen in de komende jaren uitbreiden naar andere plaatsen in Nederland. Daarnaast staat ook een Engelstalige versie op stapel, vooral gericht op de buitenlandse bezoekers/bewoners van de stad Amsterdam. In het Comité van aanbeveling voor dit project hebben zitting: K. Knot (President van de De Nederlandsche Bank), E. van der Laan (burgemeester van Amsterdam) en J. Jonker (Hoogleraar Bedrijfsgeschiedenis Nederlands Economisch Historisch Archief).